The foundation for our Whitepapers is the work we have done directly with some of the most successful financial advisors in the industry for the past 30 years. Our experience with these highly successful advisors, the observations and insights that come from hiring, developing, observing, mentoring, and working side by side with these advisors is available for you in our White Paper Series. 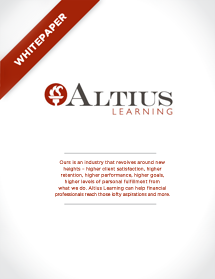 The Principles at Altius Learning invite you to share their deep experience in dealing with the most important issues facing financial advisors through their White Paper Series.